The Inca’s live on… | Blog the world!!! 1) We wanted to learn as much as possible about each country we visited. 2) We wanted to have fun. 3) We wanted to trek to Machu Picchu. The first two didn’t need much preparation, but the third required us to book a few months in advance and to have a certain amount of physical ability. 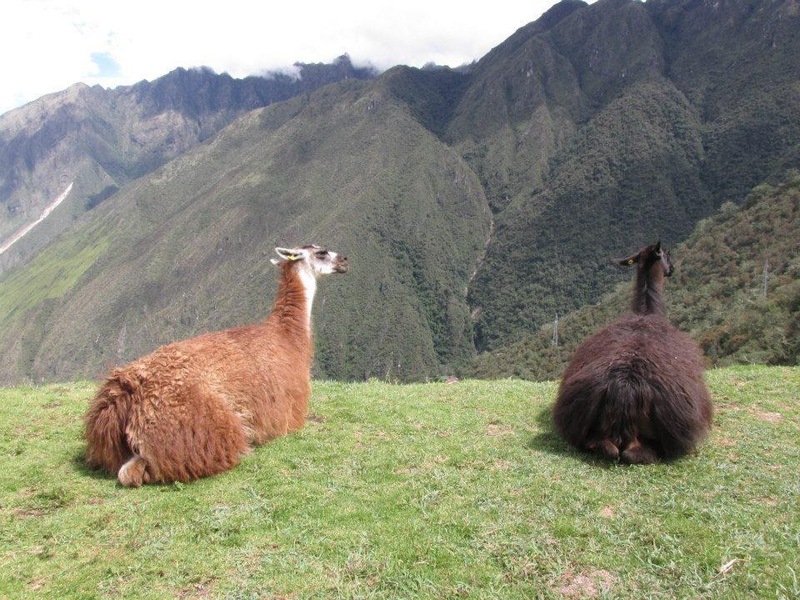 We researched the best tour company to go with (inbetween obsessively google imaging the wonder) and one company came out on top – Llama Path. They were the most expensive but we went with them anyway because at that time, we had jobs. Our training for the Inca Trail consisted of lying on Thai beaches, eating too much in Vietnam, casually walking around museums in Lima, and drinking varying types of cups of tea. To make things worse Gemma was suffering with altitude sickness just before we set off. Add to that the fact that it was the last trek before the trail closed for the rainy season and you’ll see what we were up against… This was going to be fun. It has to be said, even without these extra challenges, the Inca Trail is REALLY DIFFICULT! Well actually it has a rating of 4 out of 5, but I don’t think ‘the Inca Trail has a difficulty rating of 4 out of 5’ gives the emphasis my poor body deserved by the fourth day. Our guide was extremely knowledgable about the Inca’s. We learnt all about Pachamama, their reasons for building such elaborate cities high up in the mountains (the Spanish being only part) and the different roles each member of the Inca society would play. We learnt all this surrounded by fascinating Inca ruins and stunning natural scenery. The difficulty of the trek actually made us appreciate Inca culture even more as we learnt how they used to trek it day and night to deliver messages for the king. I bet they hadn’t been stuffing their faces in Vietnam. It wasn’t just the Inca’s who impressed me during the trek though, there were people in our group who showed Inca capabilities. Not because of their brutal sacrifices. No, as far as I’m aware none of them were into that kind of thing. But for their steely determination to keep going. There was John, an elderly Yank of around 65-70 years. He started out as sprightly as the rest of us, but by the second day his leg had given way. Although he had to be carried the last few feet to camp, he kept going all the way to Machu Picchu the morning after, slowly and with someone behind spotting him. Next was Carsten, who spent the last night outside his tent being quite violently ill. He then proceeded, not only to finish the trek to Machu Picchu, but also to climb Winnu Picchu afterwards. I asked him if he was OK after this climb and he answered “yeah, I guess another steep and painful climb was exactly what I needed”?! Last but by no means least was Gemma, who had been suffering not only from altitude sickness from day one, but also from a bug that was going round the group. It was only when she was led on the grass at Machu Picchu that I realised quite what a challenge she’d faced and overcome. As I said, the Inca Trail is REALLY DIFFICULT but these guys made me think that maybe I should take away the capitals. If they can make it as they did, anyone can. Every evening John, Carsten, Gemma and the rest of our group of 15 would eat, joke and wearily laugh. It was exhausting, but it was fun. On the last day when we reached the sun gate and turned the corner me and Gemma were able to tick number three off our list. In front of us was Machu Picchu. It was the same as on google images, only better. It may sound obvious, but it was more real. Our guide ploughed us with more information as we walked around the site. I’m pretty sure it was interesting, but I couldn’t repeat it here because, like everyone else, I was just too tired to hear it properly. Machu Picchu was full of fresh faced tourists who had come to visit on the train that morning. Half asleep on the grass I remember thinking ‘that’s a nice way to do it, on a train, why didn’t I think of that?’ But the trek had been worth it. We’d seen snow capped mountains, our first glimpse of the Amazon jungle and deserted Inca ruins we’d never have seen if we’d come by train. And as it turned out, we hadn’t needed training after all. The 15 of us returned to Cuzco with one bad leg, 15 dirty backpacks and about 7 poorly tummies but we’d made it. We’d all managed to complete the Inca Trail and we left feeling lethargic and proud with ourselves. And not only had we managed to trek to Machu Picchu, we’d learnt an awful lot about Peru’s history and had a hell of a lot of fun too.